This student-focused text addresses individual learning styles through the use of a complete study system that starts with a learning styles inventory and presents targeted learning strategies designed to guide students toward success in this and future college-level courses. Comes With13 CD’s. Each CD has about an hour of video. Digital Video Tutor is included with the textbook: Elementary and Intermediate Algebra: Graphs & Models 2nd edition Published by Pearson / Addison Wesley. A study guide is also included. 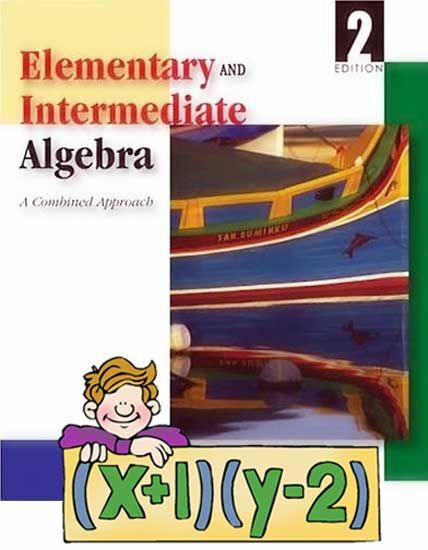 Students who approach math with trepidation will find that Elementary and Intermediate Algebra, Second Edition, builds competence and confidence. The study system, introduced at the outset and used consistently throughout the text, transforms the student experience by applying time-tested strategies to the study of mathematics. Learning strategies dovetail nicely into the overall system and build on individual learning styles by addressing students’ unique strengths. The authors talk to students in their own language and walk them through the concepts, showing students both how to do the math and the reasoning behind it. Tying it all together, the use of the Algebra Pyramid as an overarching theme relates specific chapter topics to the ‘big picture’ of algebra. The Carson algebra series addresses two fundamental issues – individual learning styles and comprehension of key mathematical concepts – to meet the needs of today’s readers. Carson’s Study System, presented in the To the Student section at the front of the text, adapts to the way each reader learns to ensure their success in this and future courses. The consistent emphasis on the big picture of algebra, with pedagogy and support that helps readers put each new concept into proper context, encourages conceptual understanding. 8 Responses to this entry. Im dumb in math, i hope this tutorial will help my kids, thanks sir max! Math Tutor DVD – Physics Tutorial Collection . Thank you too Dave D.